Quantum-Touch® is a method of energetic healing that works with the Life Force Energy of the body to promote optimal wellness. Level 1 focuses on tactile, hands on healing also providing an introduction to distant healing. Level 2 focuses mainly on distant healing. Learn more about Quantum-Touch® by visiting the QT website. Attendance at second and subsequent Live Basic QT workshop is half-price. This discount is applicable to all QT Level I workshops and all instructors. A second-time attendee needs to present the next instructor with his/her certification of completion of workshop number one. Attendance by minors under 18 is half-price. 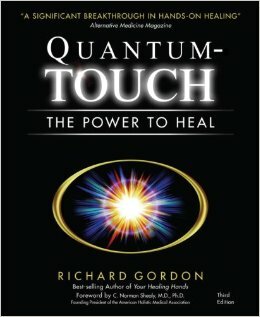 Order your Quantum-Touch® Level 1 book, “The Power to Heal”. The National Certification Board approves “Quantum-Touch” for Therapeutic Massage and Bodywork (NCBTMB) as a continuing education Approved Provider. Approved for 14 CE hours. The Live Level 1 & 2 Quantum-Touch® Workshop is valued at 13 CE Units by the International Medical and Dental Hypnotherapy Association (IMDHA). What a phenomenal video of you working with Sam who has MS. I have witnessed you work on many people in various classes, I have taken with you and am so glad this healing was captured on video in live time for all to witness. QT is an amazing tool especially in your hands. Thanks for sharing your amazing abilities with so many. I am truly blessed to call you my teacher.